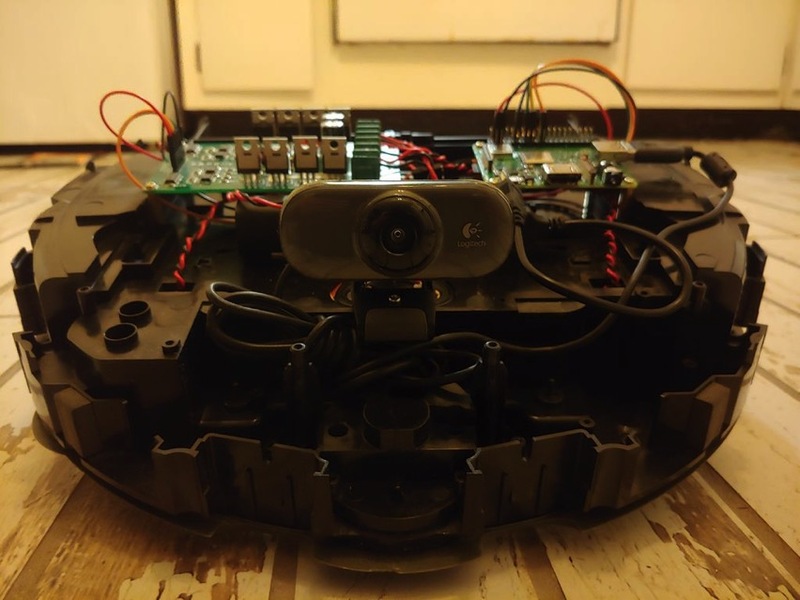 Browser Controlled Roomba Robot With the Raspberry Pi Model 3 A+ #piday #raspberrypi @Raspberry_Pi « Adafruit Industries – Makers, hackers, artists, designers and engineers! This Instructable will focus on how to give a dead Roomba a new brain (Raspberry Pi), eyes (Webcam), and a way to control everything from a web browser. There are a lot of Roomba hacks that allow control via the serial interface. I have not been fortunate enough to come across a Roomba that has current firmware or working motherboard. Either the Roomba is too old or the Roomba is dead. I found the Roomba I used for this project in a local thrift store bargain bin for $5. It still had a decent battery, but a dead motherboard. (I also found the webcam at the same thrift store for around $5). All I’m using from the original Roomba are the motors, chassis, and battery. You do not have to use a Roomba for this project. You could use different motors, wheels, and chassis if you like. I just fancy turning a piece of junk into something usable.